SAMT Hydraulics - Supplying you with Commercial Hydraulics and Commercial Hydraulic Gear Pumps and other Commercial Hydraulic Equipment and Components. Commercial has established itself as one of, if not the, biggest world names in the manufacture of hydraulic pumps and hydraulic valves. 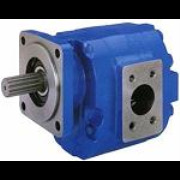 Now with the backing of Parker, Commercial continues to lead the field and their series of hydraulic gear pumps is the industry standard by which all other hydraulic gear pumps are measured. Hydraulic gear pumps, hydraulic gear motors, hydraulic piston pumps, hydraulic flow dividers, hydraulic valves and motion control. Hydraulic Gear Pumps - Displacement sizes range from 14cc up to 187cc, and includes popular model references P15, P25, P30, P31, P37, P50, P51, P75, P76, P300, P315, P330, P350, and P365. Cast Iron Hydraulic Gear Pumps - using needle roller bearings and available in flows ranging from 16 to 201.6cc/rev and pressures up to 201Bar/3000psi. • P30 / P31: Standard cast iron hydraulic gear pump / hydraulic motor - 16.1 to 64.6cc/rev Operating pressure between 172bar/2500psi to 207bar/3000psi. • P50 / P51: Standard cast iron hydraulic gear pump / hydraulic motor – 20.9 to 104.5cc/rev Operating pressure between 172bar/2500psi to 207bar/3000psi. • P75/P76: Standard cast iron hydraulic gear pump / hydraulic motor – 50.4 to 201.6cc/rev Operating pressure between 172bar/2500psi to 207bar/3000psi.